A detailed Almaty guide for business travelers that includes local advices for the best shopping districts, restaurants, nightlife and attraction points. Being the shining star of Asia, the former capital of Kazakhstan, Almaty continues to surprise the biased visitors. The breath-taking scenery of the surrounding mountains and the neat streets will be the first things to catch your attention. For being the investment center in the region, you can see many progressing constructions in most areas. However, the city has considerably large green areas. If you climb up the Kok-Tube Mountain by the cable car, a stunning view of the city welcomes you or Tian Shan Mountains may leave you breathless. Nature in Almaty is definitely one of a kind. The climate can be considered as milder when compared to the northern areas of Kazakhstan and if you are not there in the harsh winter months, you trip can rarely be ruined by severe weather conditions. People are lively in Almaty and so is the nightlife. The alcohol prices are low and there are many attractive nightclubs and bars. Shopping is also an enjoyable activity with many options may be really profitable for the tourists. Your Almaty trip will definitely contribute to you a lot and will be beyond your expectations. And if you read this travel guide before you set off for Almaty, you’ll get the most out of your trip. The cultural and commercial center of Kazakhstan, Almaty is located southwestern part of the country near the borders of Kyrgyzstan and China. For travelling to Almaty by plane, the only option is the Almaty International Airport. It is located nearly 18 km away from the city center and the national airline Air Astana has many direct and indirect flights to the city from most cities in the world. For more information about the transportation options to and from the airport, you can visit the official website of Almaty International Airport. One of the most popular place among the visitors in Almaty is Kok-Tobe Hill. It is 1100 above the sea level which makes it the highest point in the city. Climbing up the hill is very easy by a cable car from the downtown and there are also many recreation areas like restaurants a roller coaster, A TV Tower and a popular Beatles monument. Central State Museum of Kazakhstan is known as the largest museum in the country. It exhibits many important masterpieces that shows the history of Kazakhstan. The museum was first opened in 1931 in Almaty Cathedral but then it moved to its current building in 1985. In Central State Museum of Kazakhstan, you can see the Golden Warrior which is regarded as the symbol of the independence of Kazakhstan. Abay Opera House is both a tourist attraction itself and a popular entertainment spot in the city. Built in 1934 Abay Opera House was the venue for many reputable national and international operas. If it fits your schedule, we strongly recommend that you never leave the city before watching a show at Abay Opera House. Zenkov's Cathedral is mostly known for being made of wood completely. During its building process not even a single nail was used. And this makes Zenkov's Cathedral really unique. Although it served as a museum after the revolution, today it is again an Orthodox Church. 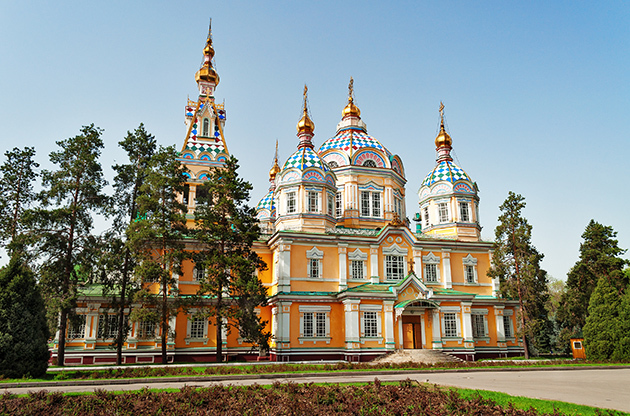 You can visit Zenkov's Cathedral in Panfilov Park. Promenade Fashion Center is one of the most important shopping places in the city. For popular boutiques in the city and stylish clothes you can visit Promenade. It is located in Abay Ave 44 and is open daily between 10:00 and 22:00. If you don’t have the time to walk from street to street for shopping, TsUM is the address for you to offer what you need in one place. From local garments, souvenirs or handicrafts to all kinds of apparel, TsUM provides you with many options for shopping. However, you’d better not expect low prices. TsUM is located in Abylai Khan Ave.
Nightlife in Almaty is actually beyond most of the visitors there are many reputable night clubs with really good music and fine ambiance. Some of the restaurants and night clubs are 24 hours open. The alcohol prices are low compared to most countries and most areas in the city are alive even in the late night. Alasha Restaurant is mostly popular among business people. It has a rich menu including horse meat dishes and the service is excellent. The traditional decoration is impressive and on some days can watch live traditional shows. Samal Restaurant is located a bit outside of the city but it is definitely worth the drive. The inner decoration is spectacular and for the best examples of Central Asia cuisine, Samal Restaurant is definitely one of the best addresses. Being formed about 3 million years ago, Charyn Canyon is almost as popular as the Grand Canyon in USA. It is located nearly 215 km away from Almaty and takes a 3 hour drive approximately and a day trip to Charyn Canyon National Park during your Almaty trip will definitely make your day. The Charyn Canyon isalmost 150 km long and in some places it reaches 300 meters of depth. One of the most popular area of the Canyon is the Valley of Castles which is an unusual rock formation.